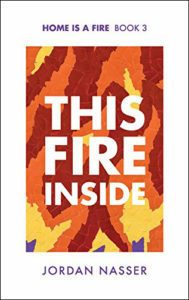 I’ve eagerly awaited Jordan Nasser’s This Fire Inside since I completed Home is a Fire and The Fire Went Wild last year. I love the characters in Jordan’s Parkville, Tennessee. This book picks up towards the end of the summer break, following the events in The Fire Went Wild. In an effort to get out of town after their huge public outing, Derek and Luke head to New York City to visit some of Derek’s friends. Luke also wants to pay a visit to his high school mentor, and best friend, Fletch. Fletch is a mess. And I’ve known people just like him from my time living in the South–loud, brash and thinks the world revolves around him. He made me cringe, which is of course his job. He makes Derek cringe too. Luke falls right back into Fletch’s orbit and that’s trouble for Derek and Luke’s still-new relationship. It can be tough to watch a couple you thought was stable get tossed on it’s head, but it works here. Consider that Derek and Luke are in a very new relationship and Luke is also newly out. It makes sense there could be trouble from many angles. The friendship (for lack of a better word) is an interesting exploration of male bonding in high school and college and how it can follow in to adulthood. Beyond Derek and Luke’s relationship, Derek starts a business and that makes for a solid secondary story. Uncle Barry has a tremendous story of his own, which I think is deserving of it’s own book. There’s also lots of shenanigans with Derek’s Scooby Gang and a pretty epic finale as well. I hope there’ll be a book four (and it sounds like there will be). There’s more to Derek and Luke’s story that needs to be told, plus Parkville has so many fun characters it’d be a shame to not give them more story time too. This book was worth the wait. It was very much a page turner. The ending will trouble some people. For me, it worked well and means I’ll be waiting patiently for Nasser to write the next installment.